The Bongales’ Southern 500 had been marketed as a throwback event with an emphasis on the ‘70s. That included bringing back old NASCAR paint schemes to the “Track Too Tough To Tame.” The Darlington Raceway has held racing at the 1.366 mile egg-shaped oval since 1950. And what better way to celebrate that time period than a band that ruled the ‘70s, Grand Funk Railroad, on Sunday before the race. 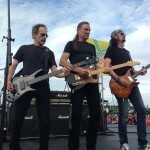 The band included the two founding members of Grand Funk Railroad, drummer/vocalist Don Brewer and bassist Mel Schacher. This lineup has been playing sans Mark Farner for nearly 20 years, and we’ll leave it at that. 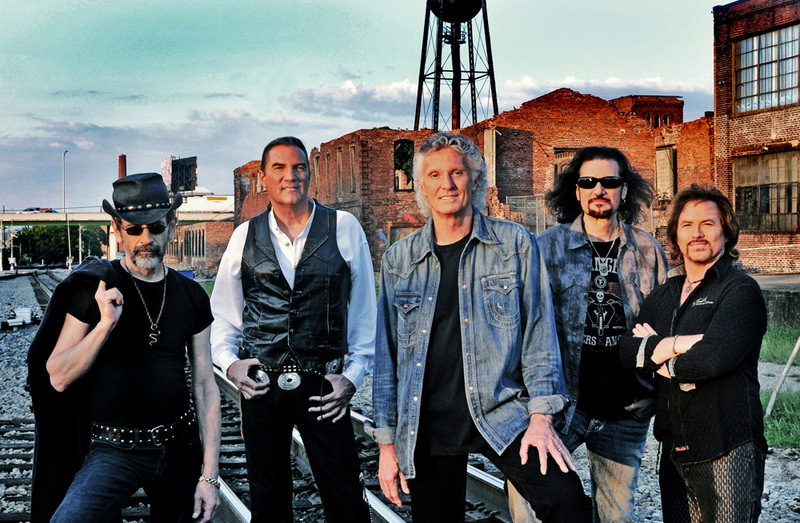 Brewer and Schacher were joined by an all-star cast with vocalist Max Carl (38 Special), guitarist Bruce Kulick (KISS) and keyboardist Tim Cashion (Bob Seger). They kept it up with the funky “Footstompin’ Music” and the Brewer led “Shinin’ On.” Carl got to showcase his vocals on the fun “The Loco-Motion.” “Walk Like A Man (You Can Call Me Your Man)” from 1973’s timeless “We’re An American Band” album was next. Kulick was spot on all night long. He even was cool about fans yelling KISS requests at him during breaks in-between songs. 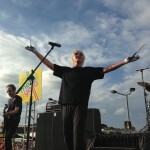 Brewer announced that they would pause during a commercial break before going into the next song. After the break, Brewer put on his signature patriotic red, white and blue top hat and everyone knew what song it was time for. They cranked out “We’re An American Band.” NBC Sports cameras could be seen filming the song because it was being broadcast live on the cable channel. Carl and band performed a 38 Special song that he wrote and sang lead on, “Second Chance.” It kind of mellowed the mood from the up-tempo straight-ahead rock of the previous songs performed by Grand Funk Railroad. Brewer left his drum set and came up to the front to the stage to start off the classic “Some Kind Of Wonderful.” Schacher started off the song with the instantly recognizable bass riff. Throughout the show, Schacher lived up to his “bong-rattling bass” as Homer Simpson would put it. The final song was 1970’s “I’m Your Captain (Closer To Home).” The intro was changed from the original guitar part to an organ part played by Cashion. They played the full version and had the entire front stretch singing with them. They then ran back down the steps and disappeared into the night. 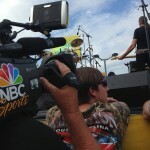 It was an abbreviated set aimed to get the fans ready for a throwback race at a throwback track with a throwback band.